In the beginning of Spring we see temperatures go up and down and many of us may start to fight a cold. Here are my top 5 food choices to beat it! Garlic is rich in a compound called Allicin -which is known to increase immunity. A lot of research has been done on the benefits of consuming garlic on a regular basis to prevent or reduce cold symptoms. Garlic can act as a decongestant and break up the mucus that can be lingering in your throat, nose, or chest. Studies show that when taken consistently garlic can reduce the frequency of colds throughout the year. To maximize the benefits of eating garlic without indigestion and bad breath is to crush a clove of garlic and let it to sit 15 minutes before cooking. The oxidation of the garlic releases the immune fighting enzymes. One container of yogurt contains a very powerful punch. Yogurts contain probiotics “the good bacteria” that can fight off respiratory infections and increase your immunity. The nutritional combination of carbohydrates and protein that it contains gives your body the nutrients it needs to increase your energy. And finally the cold creamy texture of the yogurt may help sooth a sore scratchy throat. 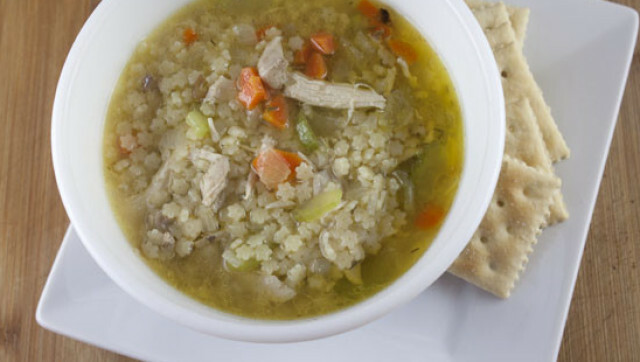 The “ Jewish Penicillin” actually does fight colds. The soup contains anti-inflammatory benefits that can decrease the inflammation in your nasal passage. It’s full of root vegetables and spices that are abundant of antioxidants. Not only that, but the hot temperature kills off the bacteria and infections lurking in your throat. Drinking lots of fluids can help flush the virus out of your system and replenish the fluids that are lost while you sneeze and sniffle. A hot beverage opens up your airways making it easier to breath. Choosing certain teas can increase your immunity. On the top of the list is green and white tea. Both contain catechins (EGCG and ECG) that act as antibacterial and antiviral agents to combat any cold symptoms. Honey has been known to reduce fever and the length of a cold. Honey has antioxidants and anti-inflammatory properties. It can sooth a sore throat and suppress a cough. Using the unpasteurized honey is known to have the most medicinal power. Making yourself a cup of tea with a tablespoon of honey is a sure way to melt away any cold. Questions? Drop me a line! Here’s to eating well ! copyright (c) 2017 – Fitinyourdress.com – Purple Empower, Inc.